I bring to you today a very obscure anime called Future Boy Conan. This 26 episode TV series is based on the Alexander Key novel The Incredible Tide, and I find it near criminal how few people know about it. As difficult as I find it is to pick favorites, Future Boy Conan is my favorite Japanese cartoon series. Even though one may not have heard of this forgotten gem, the creator of this anime is most certainly well known. It is the director, writer, and animator of many Studio Ghibli films, Hayao Miyazaki. Before his critical acclaim and before the creation of Studio Ghibli, Miyazaki worked on many animated productions, but I would argue that Future Boy Conan is where one can best see the origins of Studio Ghibli’s style and influence and what perhaps solidified his directorial career. 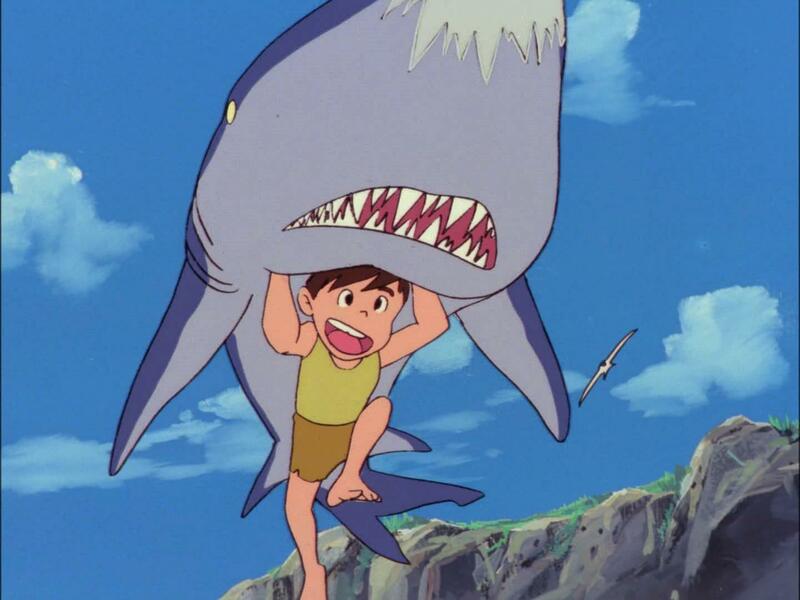 Future Boy Conan was made in 1978 and despite being made more that five years prior to the founding of Studio Ghibli, one can definitely see all the tropes and themes that are essential in nearly every one of Miyazaki’s later films – environmental undertones, anti-war overtones, strong female characters, morally ambiguous antagonists, and, despite the older look, the Ghibli art style. If you are a fan of Miyazaki’s works, you can definitely see the comparisons, and if not, you get a really brilliant show that is ahead of its time. Instead of being episodic, like most anime during this time period were, each episode folds into another making a complete overarching storyline. Not only that, but the art, which is nowhere near the quality we’re used to with today’s animation technology, was miles ahead of most anime of the time. The backgrounds are gorgeous and imaginative and the characters’ movements are smooth and natural. You can see that a lot of effort was put into this show. On the other hand, Future Boy Conan is not without its flaws, most of which can be attributed to it being made back in 1978 when anime in Japan was still dealing with some budget and technology issues. It also suffers from a time when the world had very lofty ideas of what technology we would have 30 years down the road. The show begins with honestly one of the most annoying and sappily happy opening themes you could think of (which is why I didn’t add a theme song video to this article like I normally would). This song, which sounds like something the von Trapp family would sing while romping around the Swiss Alps, is then followed with a scene accompanied by a droning saxophone in the background and a documentary-esque voice-over telling the viewer that humans have more or less destroyed the Earth and most of humanity with it, and that we are now in a post-apocalyptic time period. Mood-whiplash anyone? Oh yeah, and this has all happened in 2008. Apparently by now we should have flying machines, the ability to manufacture bread from plastic, and have created magnetic weapons tons of times more powerful than the atomic bomb that created fractures in the earth’s crust thereby sinking most of the world’s continents, leaving what is left of humanity to cling to small islands and anything that could float. This is what we see in the first five minutes of the series (and really at the beginning of every episode, I suggest after the first episode, just fast-forward past all this crap). But if you can get past the unrealistic technology, the campy sci-fi sound effects, and the sometimes low quality art style of Japanese anime in the 70s, you get a fantastic show. The story itself follows the titular Conan, who lives on an isolated island with his grandfather as the only other surviving resident. Right from the get-go we see Conan is not exactly your average 10-ish year old boy, as he has abnormal strength and the ability to hold his breath underwater for long periods of time. Heck, in the first scene we see him in, he takes down a shark. No really. Conan’s life changes when a girl named Lana washes up on shore. It turns out that she has ESP and due to her being the granddaughter of a great scientist, she is on the run from a group of people from a city known as Industria, who want to use her abilities to find her grandfather and thus use his knowledge for dastardly deeds. Conan ends up getting caught up in a life-or-death struggle for the salvation of what remains of humanity when he leaves his little island to help her. Lana can also talk to birds. There are parts of of this show that slightly subvert some of Miyazaki’s tropes or perhaps aren’t done as well as they are in his movies. For instance, Lana becomes a damsel in distress a little more than what I like in my female lead. On the other hand, she does do her fair share of heroics. There is also perhaps a bit too much of Conan and Lana dramatically yelling each others names in times of distress. The environmental theme and other story morals can be a little more preachy and in your face than his movies, which tend to be more subtle. However, some of this is done well through the use of visual comparison of the city-like Industria and the peaceful village of High Harbor where Lana is from (though we are given no doubt of who to root for). It is also provides interesting commentary on how different groups of people may choose how to organize themselves and continue living after an apocalyptic event. What I enjoy most of the show and what I think it does best is the portrayal of the characters. And I don`t just mean personalities, though those are great too. I just enjoy watching them. This show really knows how to use its visual medium, and fits the mantra of “show, don’t tell” excellently, making it fun to watch and see how our main characters get out of certain situations. This is especially true in regards to Conan, who is probably the most out of his comfort zone. It is interesting to see him figure out his way around cultures and technology that he literally knows nothing about, having lived on a small island where the only other person he’s really known was his grandfather. Conan is not portrayed as very smart, especially at the beginning, but he is extremely clever and resourceful, and it`s neat to just watch him put that resourcefulness to the test. Of course being able to bend large metal bars and lift boulders doesn’t hurt. There are a lot of excellent emotional and suspenseful moments as well. This show is awash with terrible things that could, and do, happen to our main characters, and so as a viewer, one gets very much sucked into the story. There are some scenes I legitimately have a tough time watching, as they include young children smoking and drinking, receiving beatings, and nearly drowning. You worry about what could happen to them, become intrigued as to how they’ll get past a certain obstacle, and you rejoice when they get out of a tough scrape. Overall, Future Boy Conan is a great show, that has the extreme misfortune of being very old and not very well known or easily available, even within its country of origin. But if you do end up finding it somehow, then you’ve found a treasure of a TV show worth looking for.